The pride that Vermont takes in its town meetings likely has something to do with the sense of small-town democracy that the tradition embodies. This was evident in the dialogue that took place in Wilmington, which voted overwhelmingly against a measure to replace an in-person Town Meeting with voting by paper ballot. This year, I attended Middlebury’s Town Meeting for the first time since moving to Vermont nearly six years ago. Unlike Wilmington and smaller Vermont towns, Middlebury’s Town Meeting is a hybrid: The town’s face-to-face meeting takes place on Monday night in order to introduce and discuss ballot measures that townspeople will vote on by paper ballot on Tuesday. While I always vote on Tuesday, I’ve never attended the Monday night meeting; it’s just hard for a parent of young children to get away at 7 PM on a Monday. But this year, I was a candidate – the only candidate – for an open spot on the Ilsley Public Library Board of Trustees. Although I felt fairly assured of victory in my race against myself, attending Town Meeting seemed like the right thing to do. Middlebury’s Town Meeting was held in the Middlebury Union High School auditorium. The meeting was expertly moderated by former Governor Jim Douglas, as it has been for three decades. The seven members of the Middlebury Selectboard sat at a long table on the stage, in front of the set for the upcoming high school musical, Seussical. Unlike many other town meetings, there were no baked goods. Here’s what I might have written about the Middlebury Town Meeting a year ago: It was amazingly, sweetly civil. No voices were raised, and very few questions were asked when the floor was opened. The most discussion in the three-hour-long event concerned whether the town budget should include roughly $30,000 for the Middlebury Police Department to purchase a police dog (Did Middlebury really need a police dog? Did that budget include a vest for the dog? What breed of dog was being considered?) 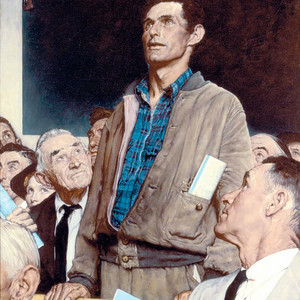 Arguably the most controversial item came at the very end of the meeting, when a gentleman moved to request that, as the Vermont State Legislature considers approving the legalization of marijuana, the Middlebury Selectboard refrain from taking an official position until the town holds an open forum for citizen discussion – which seemed like a reasonable request. A year ago, the Town Meeting would have only cemented my affection for Vermont, where throw-back traditions like Town Meeting Day are also revolutionary events, rare forums for true democracy; where local elected officials sit before a painted background of Truffala Trees, while down-to-earth citizens make sure their police dog will be outfitted with a vest. But this year, the Middlebury Town Meeting felt slightly odd. This year, of all years, it seems as if the citizens of our country have learned something about the importance of active participation in democracy. This year, following a shocking Presidential election, we’ve all seen just how much can be gained or lost by the votes we cast. This year many of us who believed we could coast through life without giving much thought to our government have been forced to think again. This year voices have been raised loudly across our nation and, very recently, on the campus of our town’s namesake college. The odd thing is: none of this was in evidence at the Middlebury Town Meeting. As this paper reported, the discussion at Town Meeting this year was “devoid of controversy” (code for: “our taxes aren’t going to be raised.”) Not only was the open spot on the Library Board an uncontested race: none of the races was contested. It’s a strange thing to have 11 open positions on the ballot, with only 11 people listed to fill them. Also strange: The Addison Independent reported that there were roughly 150 people in attendance at the Town Meeting. According to the 2010 census, Middlebury’s population is about 8,500. Subtract the roughly 2,500 students at Middlebury College, and that’s about 6,000 town residents. Which means that only 2.5% of the population attended Town Meeting. And that 2.5% that did attend? I’m terrible at estimating ages, but I’d say that the average age of the attendees was somewhere in the 50-60 range. And the racial distribution was 99% white. There are probably many explanations for this. As mentioned previously, a 7 PM meeting on a Monday is not convenient for everyone, particularly families with young children or people who work nights. And meeting attendance doesn’t necessarily equal apathy, since the actual voting happened the next day. As for the meeting’s lack of diversity, it’s not entirely surprising in a town that’s 90% white to begin with. Still, I know many Middlebury residents who love this town, have great ideas, and are politically engaged. I see their passionate posts on Facebook: These are people who write letters to their congresspeople and call their senators. Their voice, as one of 6,000 in town, carries further than it does on a state or national stage. Where were they? Even more surprising was that those who attended the meeting – who were invested enough to show up – had so very little to say. Was this really because nothing controversial was up for discussion at the meeting? Perhaps. But I can think of at least two agenda items that were reported upon at the meeting, which might have merited a question or two. The first concerns the Middlebury Business Development Fund (MBDF), which was approved at the 2012 Town Meeting in order to “create, recruit and retain high quality jobs” – an important commission in a town that is losing jobs, that has difficulty attracting industry, and that’s becoming a prohibitively expensive place to live. The MBDF was funded by a one-cent increase on the tax rate and a matching contribution from Middlebury College, and was approved for an initial run through 2018. I understand that people are happy to have the one-cent tax removed. But now it’s unclear what the future of business development is in Middlebury, and business development is a critical issue here, as much as we may dislike change. This seems equivalent to repeal without replacement. Also: A commitment was broken early. Somebody just lost their job – a person with a family, who is our neighbor. Nobody asked about this. The second issue is the VTrans Downtown Bridge/Tunnel Project, a messy tangle that involves the need for the state to repair two crumbling and unsafe downtown railroad bridges (from what I can tell, this should have been done approximately yesterday) – a repair that’s going to block off downtown Middlebury and hurt its fragile businesses for about 10 weeks. The project has stalled repeatedly, and is currently awaiting the results of an Environmental Assessment. Again: no questions at Town Meeting. It was an interesting lesson in how it’s possible to take pride in participatory democracy, while simultaneously not participating; how it’s possible to be both concerned and passive. I include myself in those statements. After all, I could have asked questions at Town Meeting – and I didn’t. I’m a writer, not a speaker; I was waiting for somebody else to ask the tough questions. Maybe we all were. Still, I’m glad to have attended Town Meeting. I voted differently on Tuesday than I would have without hearing the various ballot measures introduced. I’m going to try to make it to future Town Meetings; maybe someday I’ll even feel brave enough to ask a question. In the meantime, I’m looking forward to serving out my three-year term on the Library Board.